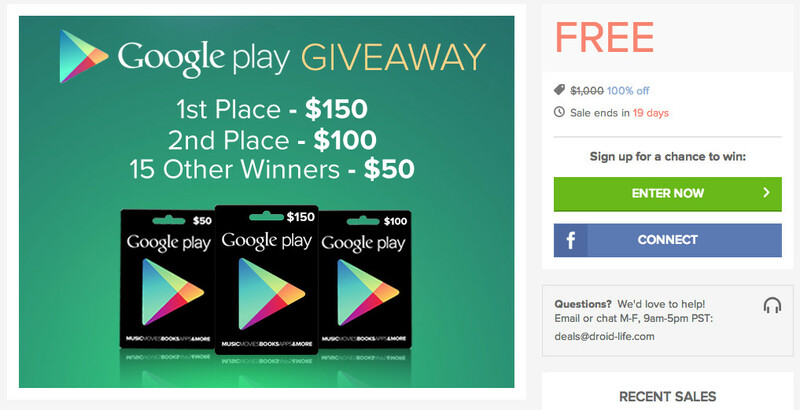 Today is the last day to enter for the chance to win your share of $1,000 in Google Play credit that is up for grabs through the Droid Life Deals store. To be more specific, one grand prize winner will receive $150 in gift cards, the runner-up gets $100, and 15 others will see $50 cards. Entering could not be more easy. Once logged in to the store itself, there are multiple options for you to choose from to enter. You can like us on Facebook, tweet about the giveaway, share it on G+, or any of the other choices listed. It’s free Google Play credit, so why not? Details of the contest can be found below. It’s your time to access all that the Google Play Store has to offer! Now you can purchase any of the awesome games, apps, movies, music, books and devices you want with this incredible Google Play Giveaway.